Once again Julie had to work on Friday and couldn’t take the day off. So my parents and I left on Thursday night bound for Yosemite. 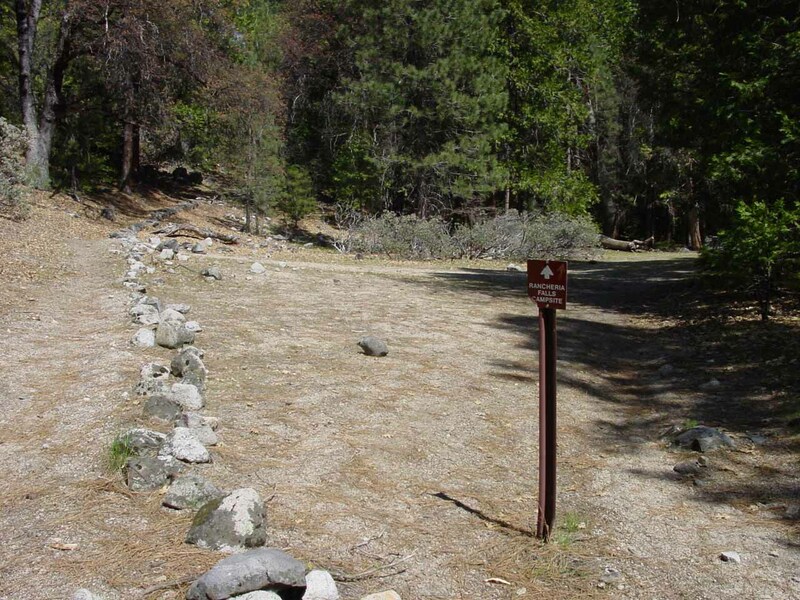 This time we would camp at Hodgdon Meadow, which was near the Big Oak Flat Entrance. 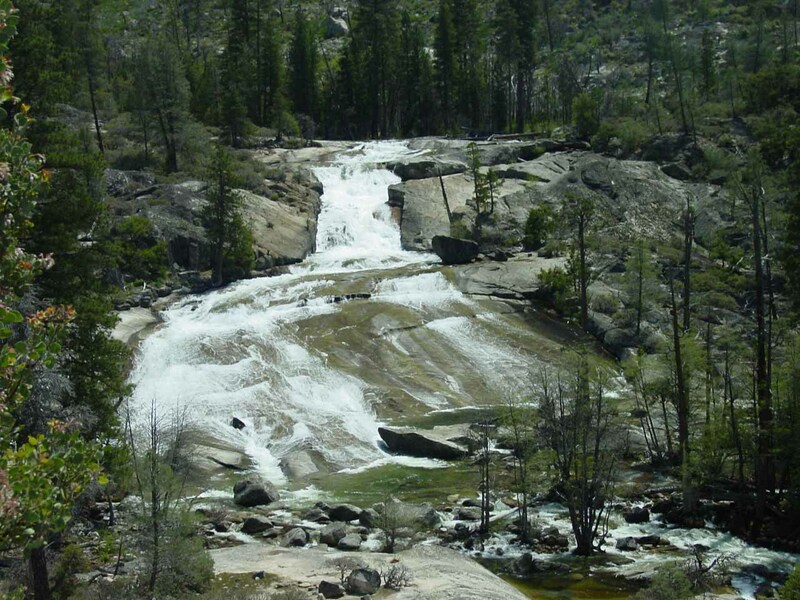 Although the trip encompassed sights such as Carlon Falls, Foresta Falls, and of course, the Incomparable Valley, the main focus of this trip was to at least see what Rancheria Falls looked like. 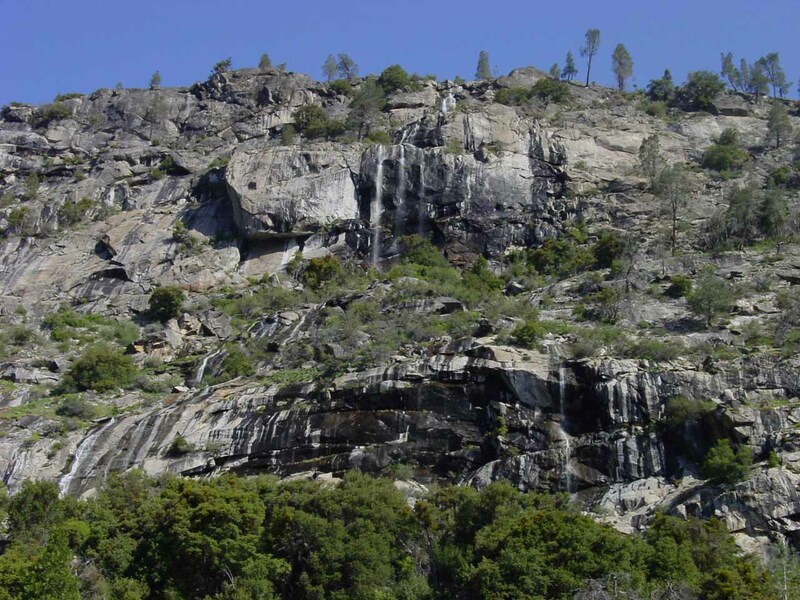 Rancheria Falls would require about a 13- to 14-mile return hike beneath the northern cliffs of Hetch Hetchy. 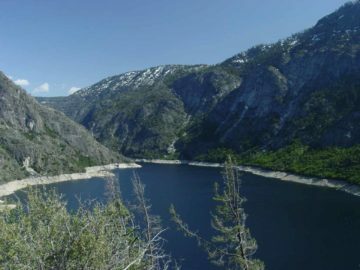 It can be a very hot hike as shade would be limited, and Hetch Hetchy Valley tended to be 10-degrees hotter than Yosemite Valley due to its lower elevation. 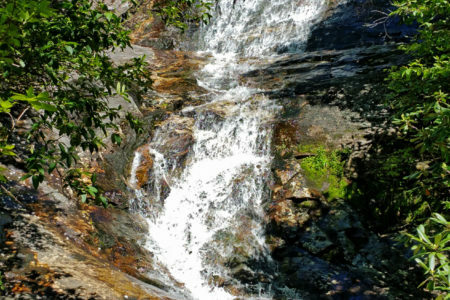 We knew this because we had hiked out to Wapama Falls in each of the last two years – once under intense Summer heat while also experiencing the unforgettably flooded conditions beneath Wapama Falls while the other was under pretty agreeable Spring weather. So after our first night in Hodgdon Meadow, everyone awoke to very nice weather. It contrasted with the storm last week that forced me to cancel my reservation (at a cancellation fee cost of some $13 and change) and make a last-minute reservation for this weekend. 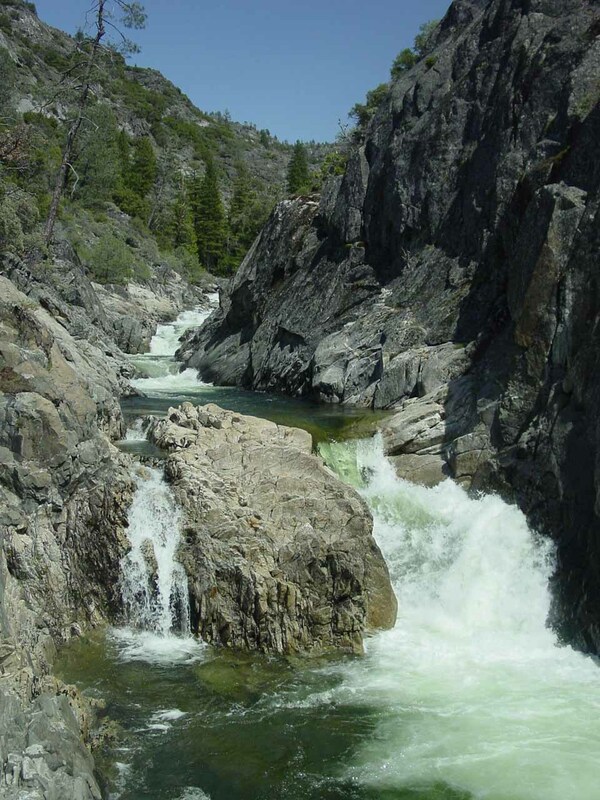 Being that 2004 was a well-below-average rainfall year and that Mom and I were in Hetch Hetchy just last month, we knew there wouldn’t be rushing streams going over the footbridges beneath Wapama Falls. Before parking the car at the O’Shaughnessy Dam, we took advantage of the nice facilities near the dam (probably for the employees) to attend to nature’s call. We knew it would be a long day of walking so this was a great way to make the excursion more comfortable. After leaving the parents’ SUV, we took photos from the dam as usual. 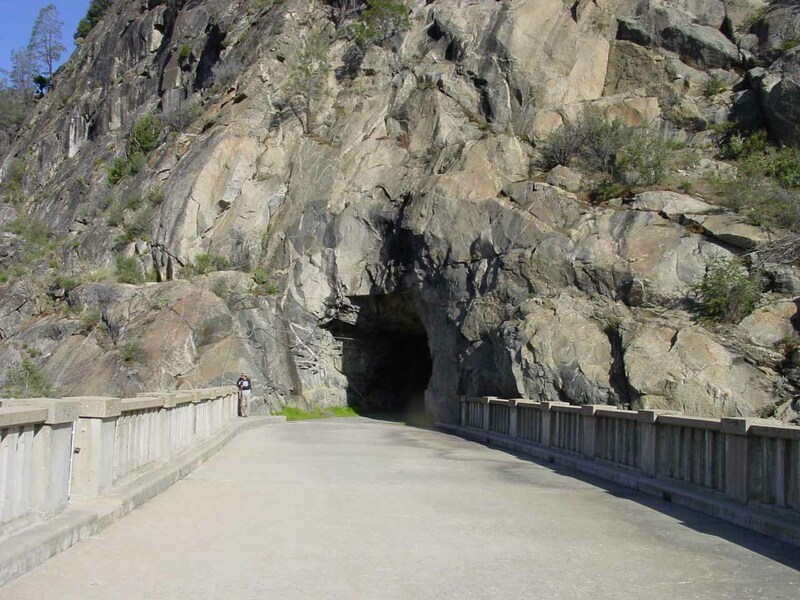 There was no high-water warning sign in front of the tunnel and Tueeulala Fall looked dry. I thought it was quite unusual for a waterfall like this to go dry in April! 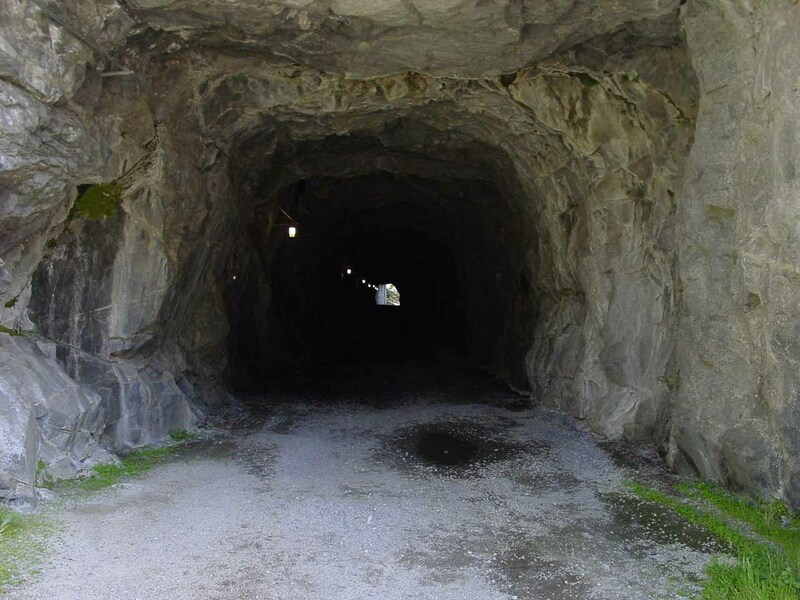 Anyhow, we continued through the tunnel and hiked the familiar stretch of trail that was a combination of packed dirt and granite. While Tueeulala Falls looked like it was dry, there was another disjoint and unnamed cascade that looked like it was doing much better. 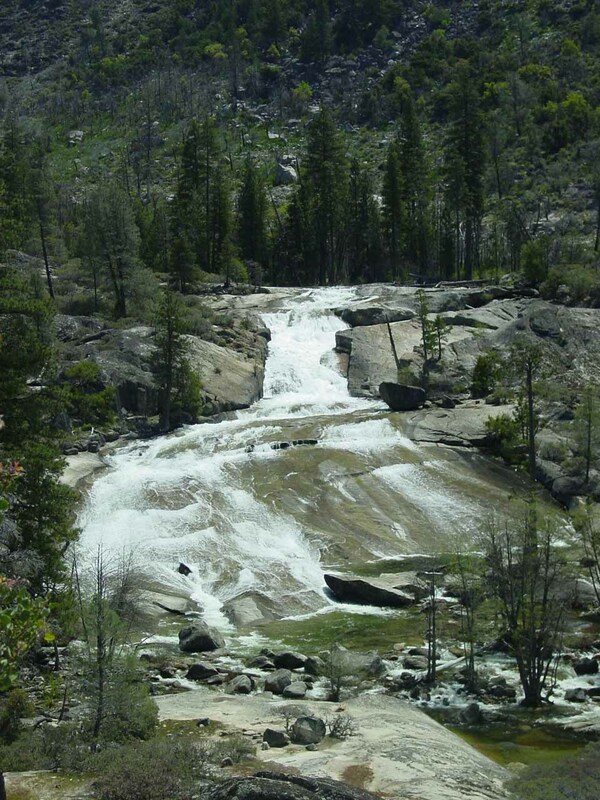 Thus, this waterfall also created a bit of a stream crossing on the long granite stretch, but it wasn’t too bad of a crossing, especially given the dry conditions from today. Anyways, we made it to Wapama Falls by 10am. And not surprisingly, this waterfall did not flood the trail like a couple of years ago. 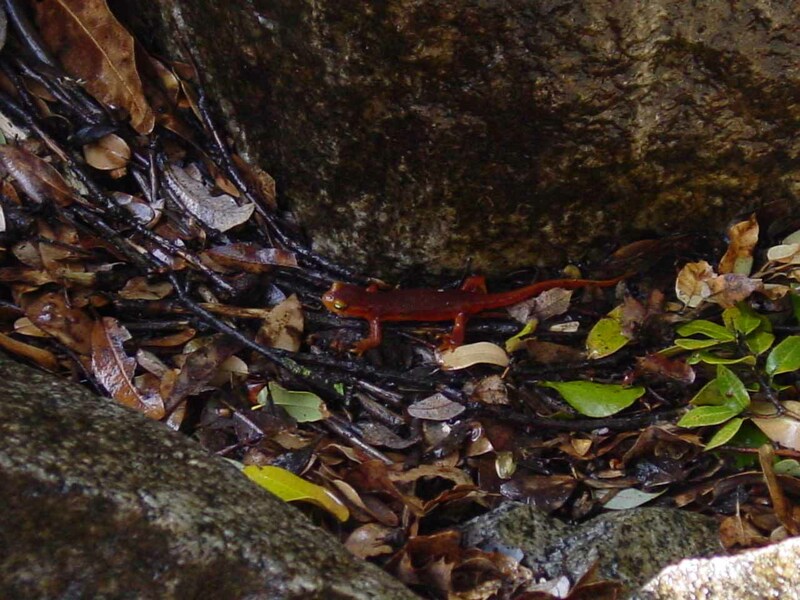 There was still enough mist underneath the footbridges to moisten the rocks and let this interestingly-colored lizard bask in the mist while trying to blend in with the environment. 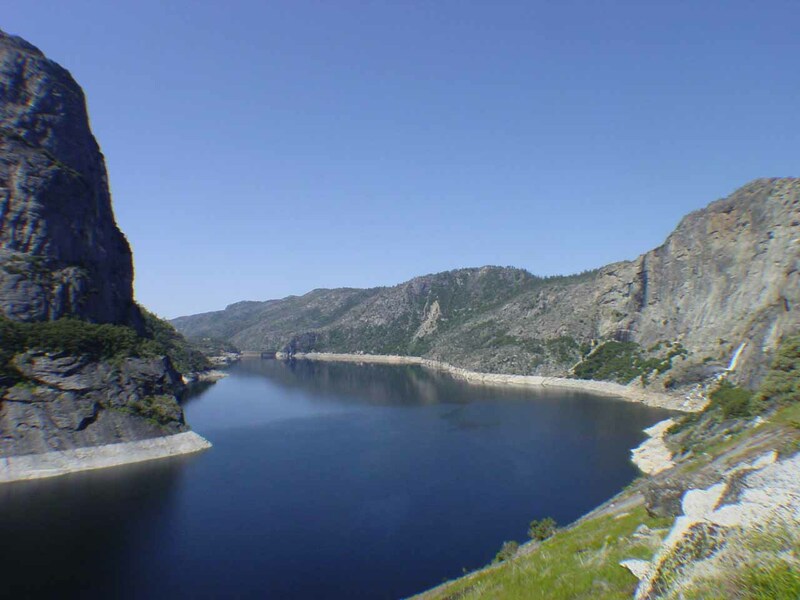 It was one of those moments that reminded us of the diversity and persistence of life found in Nature – this despite the altered environment resulting from the damming of Hetch Hetchy Valley. I’d have to say this waterfall was easier to photograph given its diminished flow. At the minimum, it was certainly not nearly as stressful as it was our first time here. So we took advantage of the situation before continuing on. 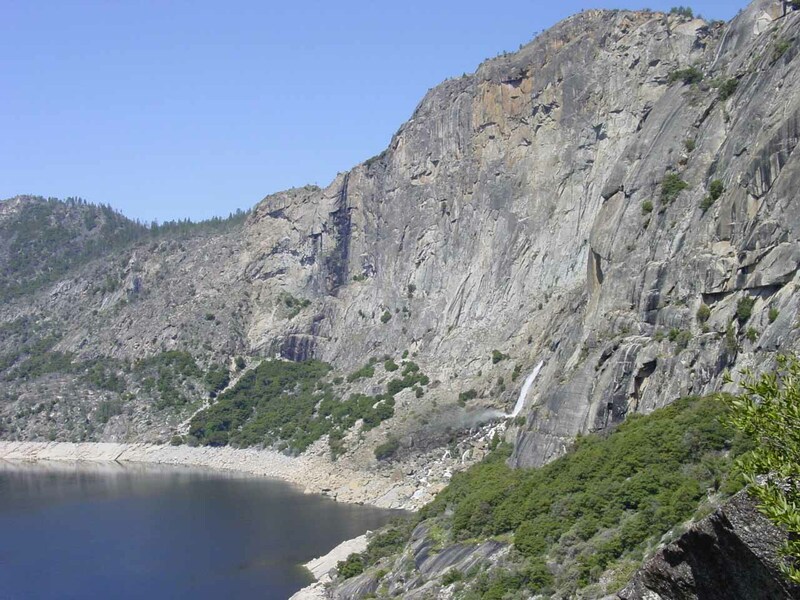 Now, we continued past the waterfall into parts of Hetch Hetchy we had never seen before. Mosquitoes were already present in the shady parts of the trail, which pitted us against our desire to cool off from the increasingly warm sun. This section of trail must have gone on forever. 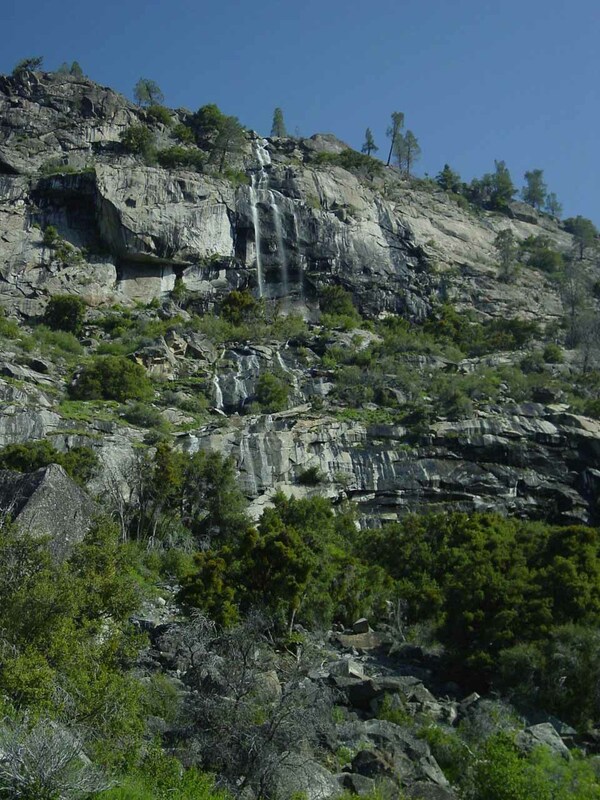 Even though we stole some glances back the other way at the foot of Hetch Hetchy with a different view of Wapama Falls and Kolana Rock, it was all dry hiking with a mix of elevation gain and loss. 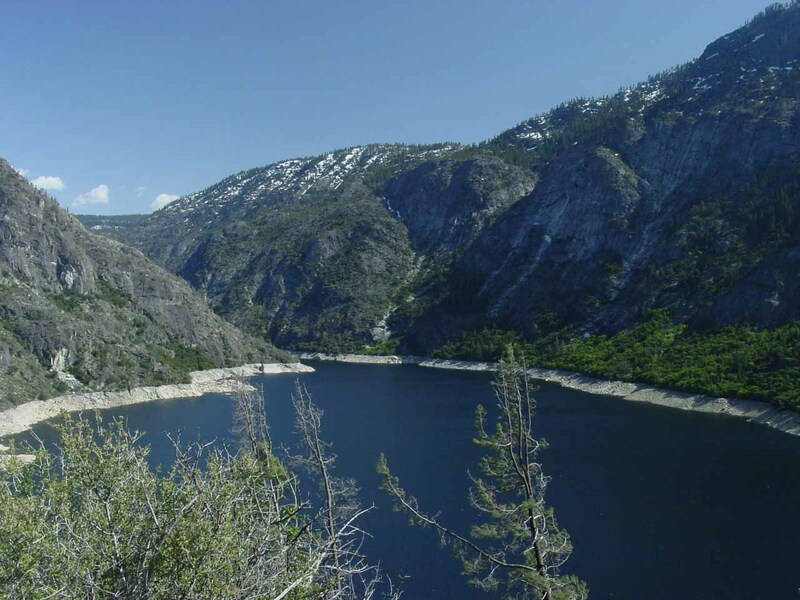 The untouchable and inaccessible waters of Hetch Hetchy kept taunting us as well. Anyways, I was wondering what the scene must’ve looked like two years ago when the trail was flooded beneath Wapama Falls and Tueeulala Falls was flowing. When we’d look back in the direction of the waterfall tandem, all we could see was the bottom of one waterfall and a stained wall. It somehow didn’t command the kind of attention that it once did. It was also interesting to see the lower parts of Wapama Falls trickle over its boulder field and scree into the reservoir below. It was definitely a perspective of this waterfall that we hadn’t gained before. However, its uppermost tiers remained out-of-sight. 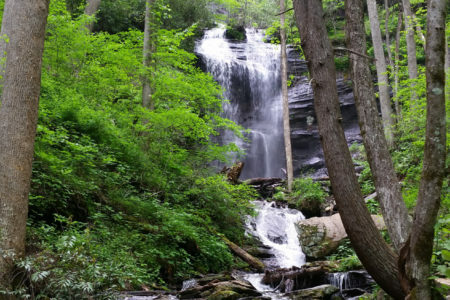 I wondered if it would’ve been better to see the full height of this waterfall from across the reservoir, but I never recalled a trail that would even let us do that. 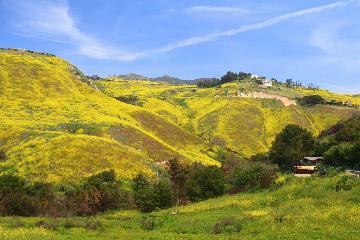 It made me wonder whether John Muir had a chance to see it before the valley got flooded forever. Anyways with the walk continuing, we were starting to feel sapped of our energy as fatigue started to set in – no thanks to the uphill hiking and the lack of shade with the unrelenting sun. It wasn’t until 12pm that we finally got close to some body of water. 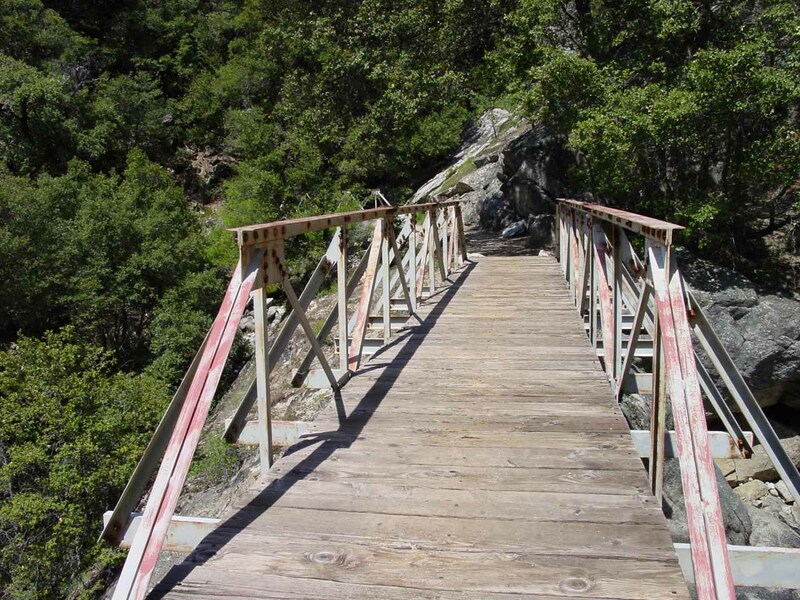 The trail crossed Tilltill Creek over a pair of footbridges. Below one of the footbridges was a pleasant 50ft or so waterfall. 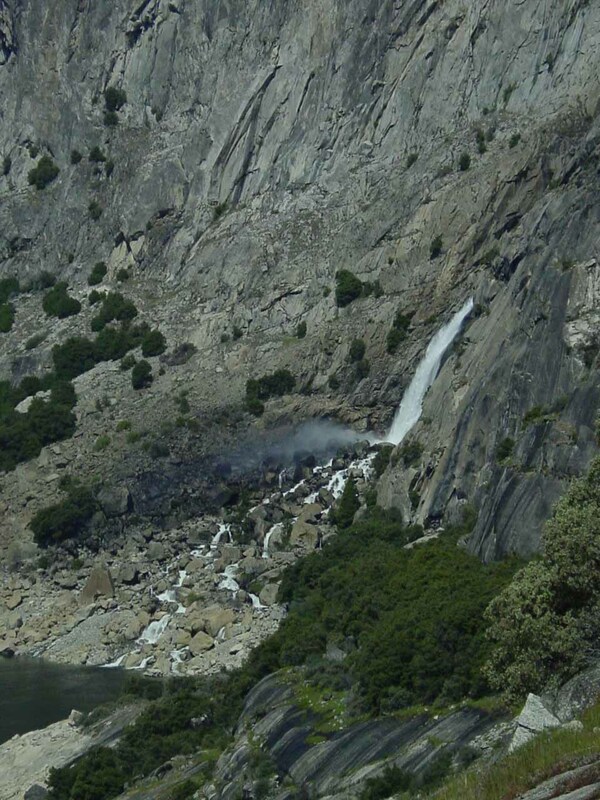 However, the falls weren’t accessible safely and the trail started to switchback steeply upwards. There was certainly no rest for the weary. 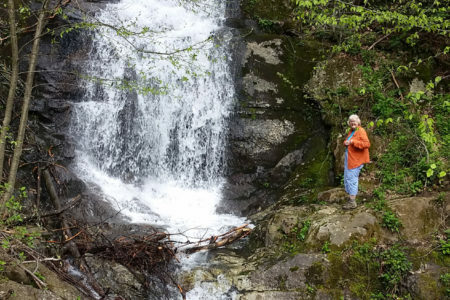 After some more dry hiking and topo map consulting at the trail junctions – interspersed with frequent water and snack breaks – we finally started to hear rushing water again. 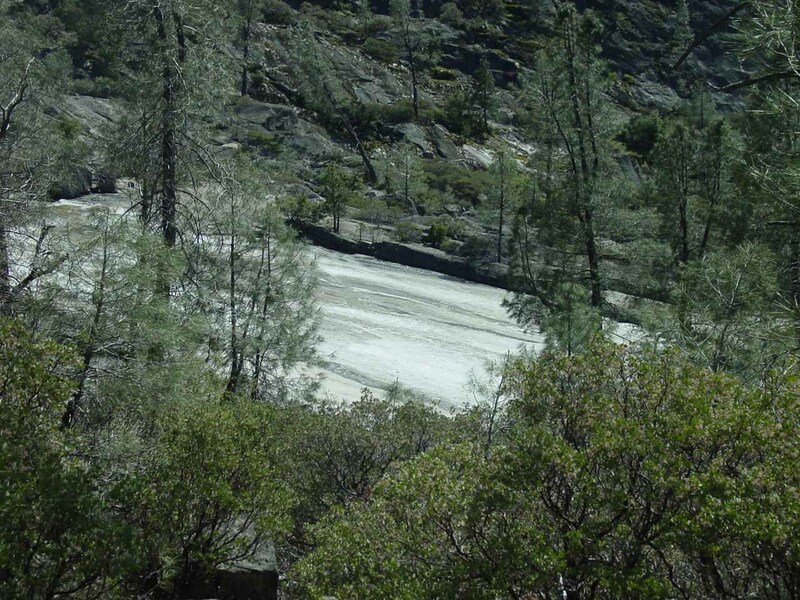 Could this be Rancheria Creek, finally? …et voila! 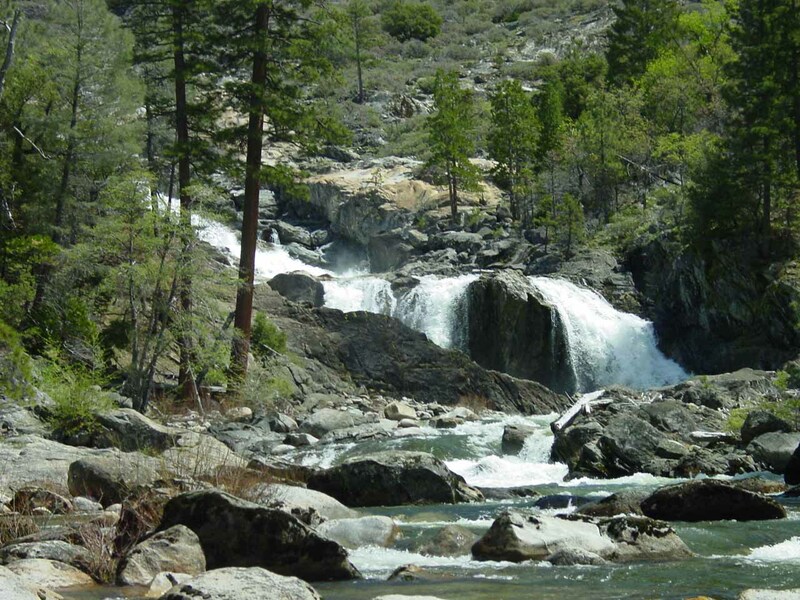 The first Rancheria Falls! 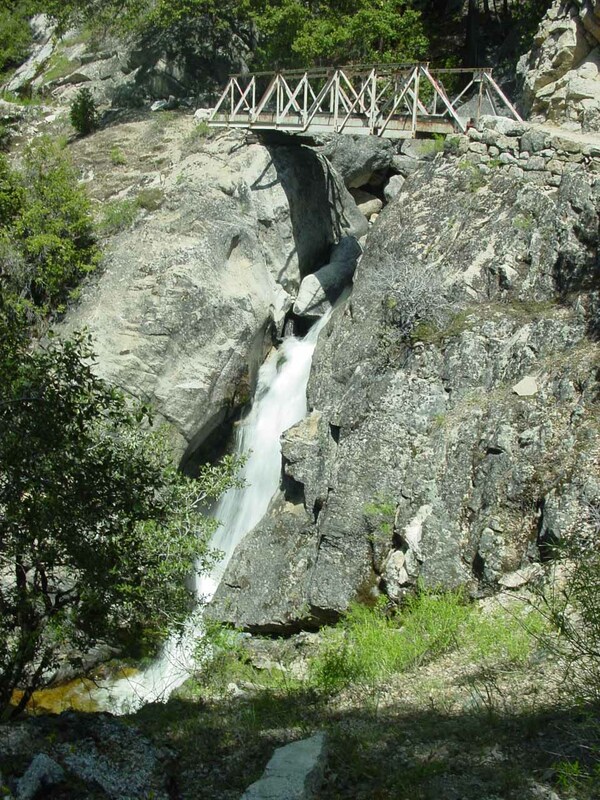 I had never seen Rancheria Falls before and this waterfall had quite a unique shape. It looked like it had somewhat of an apron shape with a very inviting plunge pool at its base. It wasn’t long before some fast young guys overtook us here and announced their intentions to us to get down to the pool – naked! All of us chuckled at each other. No we weren’t about to join them and there were more waterfalls up ahead. So the parents and I continued walking and took the spur that led to the backpacker’s camp. 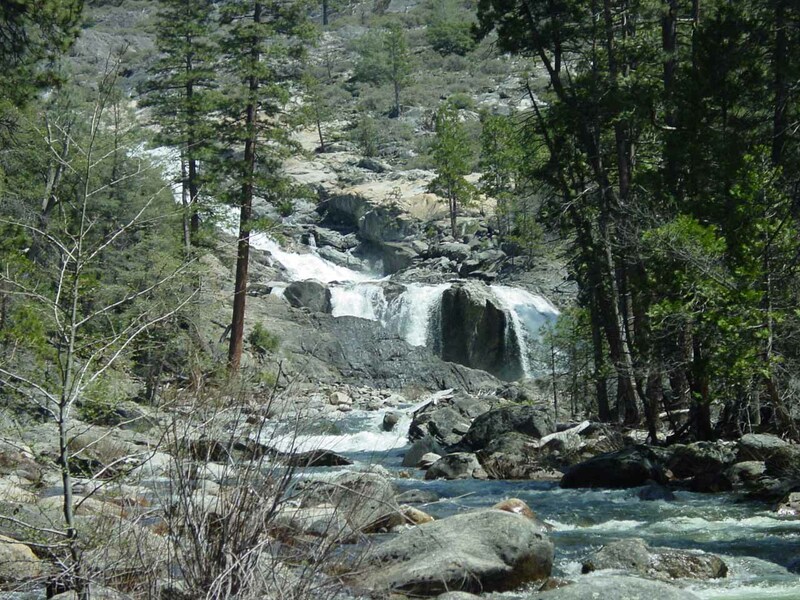 Along the shores of Rancheria Creek in the shaded area of the empty clearing designated for camping, we saw another cascade. This cascade was difficult to get a good photo of because of dry foliage getting in the way. 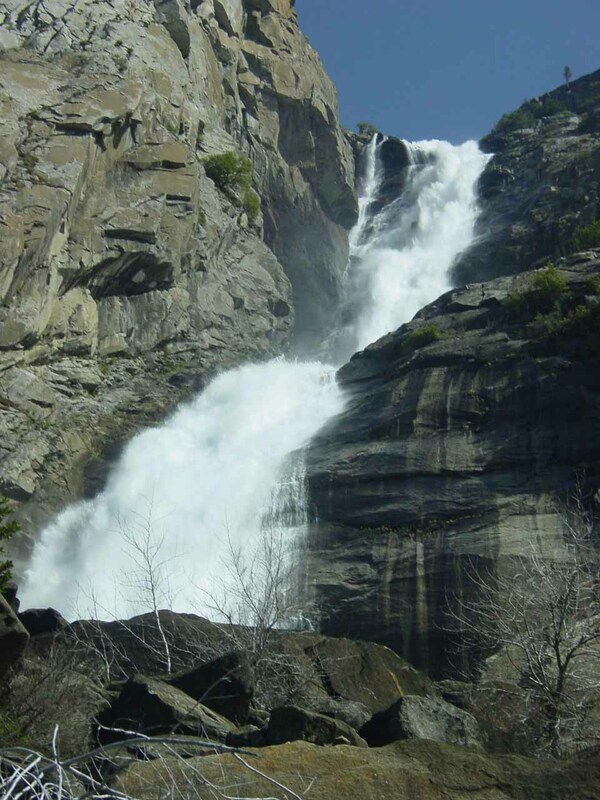 It came down in a long slope before splitting up at its base in two parallel falls. 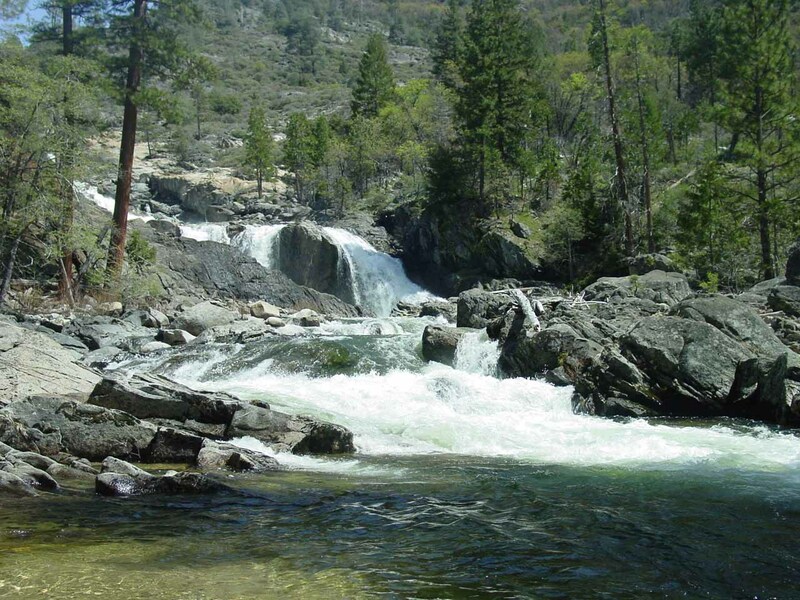 Then Rancheria Creek proceeded to rush downstream alongside the backpacker’s camp. So we had a nice lunch consisting of pita bread stuffed with some kind of Costco Greek Salad. Too bad we didn’t have hummus otherwise this would’ve really hit the spot. It was about 2pm when we finished our lunch and rest. 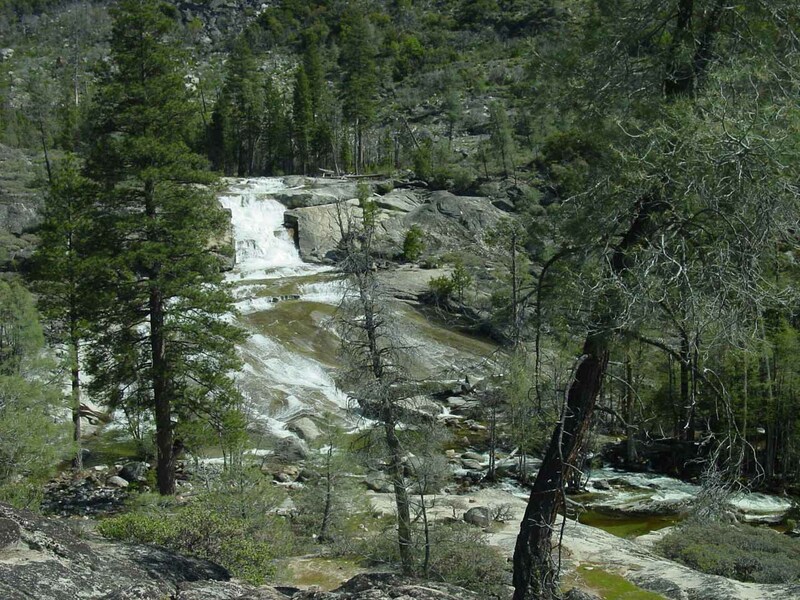 We had to continue onwards to see the rest of Rancheria Falls before we could call it a day. After spending a few wasted minutes of trying to find the trail from the end of the backpacker’s camp, we finally gave in and retraced our steps to the trail junction. 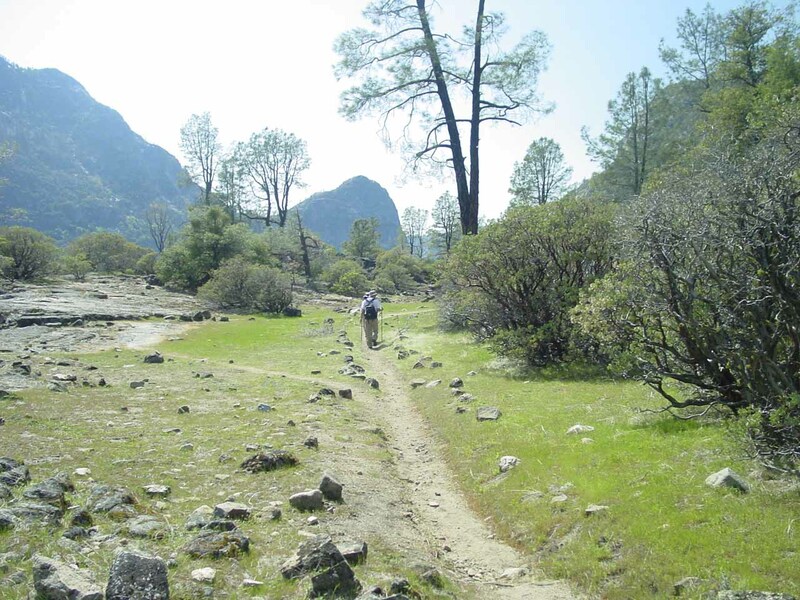 Then, we continued along the Rancheria Creek Trail from there. The trail was climbing again up more switchbacks. 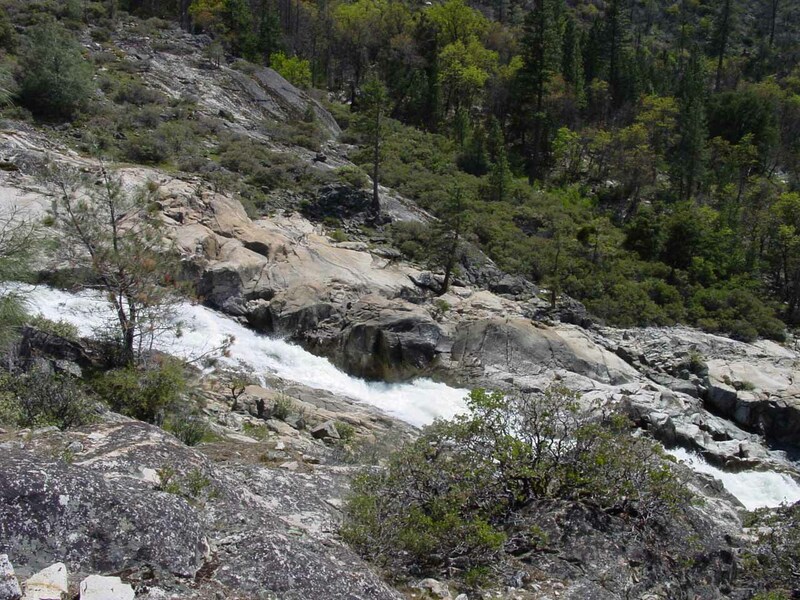 There was another trail junction up here, but we stayed the course and remained close to Rancheria Creek. There were also signs about lightning though I didn’t quite get the same sense of danger here as I did when exposed atop Half Dome. 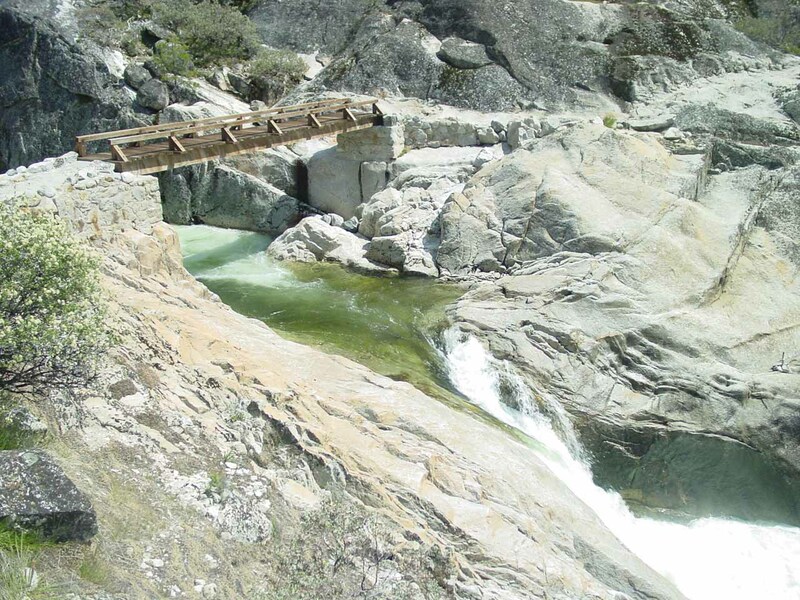 Anyhow, the trail ultimately led to a footbridge crossing Rancheria Creek. Downstream from the footbridge, the creek cascaded in a steep yet gentle slope slanting its way towards that second Rancheria waterfall we had lunch at. Upstream from the footbridge, there were more smaller cascades surrounded by some rock walls. Being that it was now 2:30pm and getting late with still around 7 miles to get back to the car, we decided to turn around and head for home. 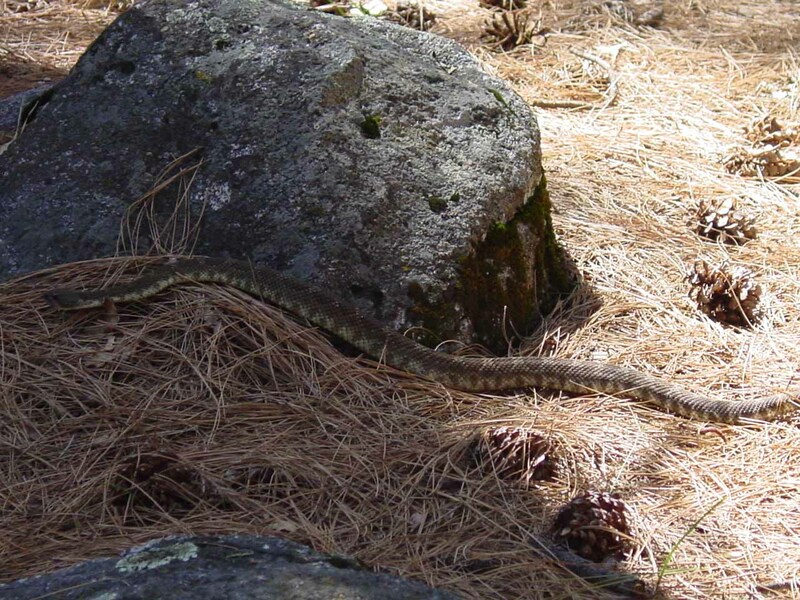 …and to my surprise, a rattlesnake was slithering across the trail in front of me. I’ve seen rattlesnakes before, but never did I expect to have slithering company this close to me. I was fortunate it was not in a testy mood. 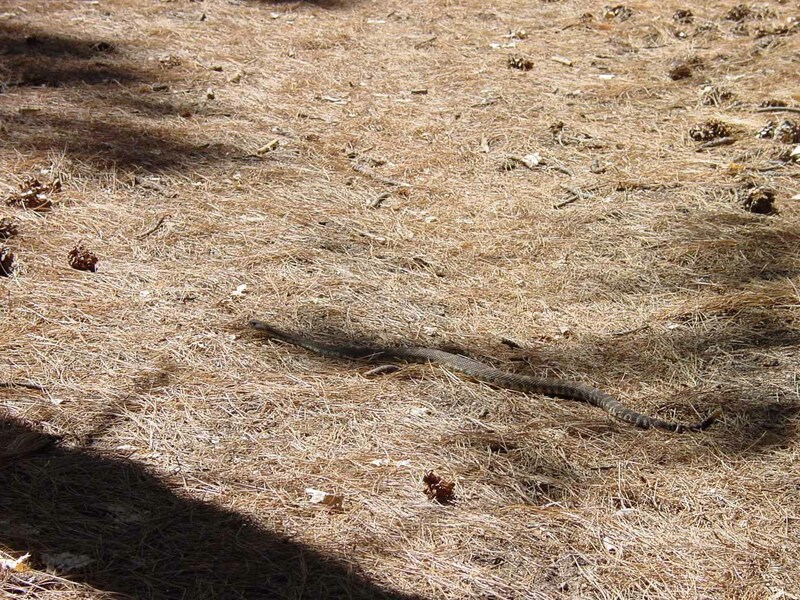 It merrily slithered and went about its way towards the shaded confines of the backpacker’s camp. I took this opportunity to take photos of the snake – being careful to stay behind it and not close it. Just then another hiker come up from behind me and was wondering what I was doing. It must’ve seem strange to him that I was alone with a camera shooting at apparently nothing from his vantage point. So we engaged in a little small talk. I told him about the rattlesnake before me, but somehow I sensed he must’ve thought I was nuts. That’s because he proceeded to keep walking past me and kept going forward – apparently unaware of the snake nearby. Just then, he looked down and was instantly startled at how close he came to stepping on it. In a knee-jerk reaction, he quickly jumped away from it, and then went about his merry way down the trail – leaving me to continue photographing the snake (from a distance of course). After the snake disappeared into the shadows, I too continued the hike. My parents were waiting for me by the first Rancheria Falls probably wondering what took me so long. I told them about the rattlesnake and got a surprised reaction from Mom (apparently she had a bit of a phobia of snakes). So after checking out that first Rancheria Falls for one last time, we then proceeded to head for the parked car some 7 miles away. The hike back seemed like it involved lots of downhill and uphill hiking. The uphill sections were particularly discouraging and tiring considering the miles we have already logged today. The afternoon light seemed to have made the back end of the reservoir somewhat attractive, and it momentarily took our mind off the bit of the uphill stretch that felt real brutal at this point. But once we got to where the trail sloped downwards towards Wapama Falls, we knew there’d be no more significant uphill sections left. By about 5:15pm, we made it back to the car, and by 6pm, we were back at Hogdgon Meadow. We had spent the remainder of the evening spoiling ourselves to Curry Village pizza and a shower. We ultimately returned to Hodgdon Meadow by about 10:30pm.